As a Disney lover, we have always measured the Goof’s height by what rides he can do, or which ones he is aiming to be able to do next. 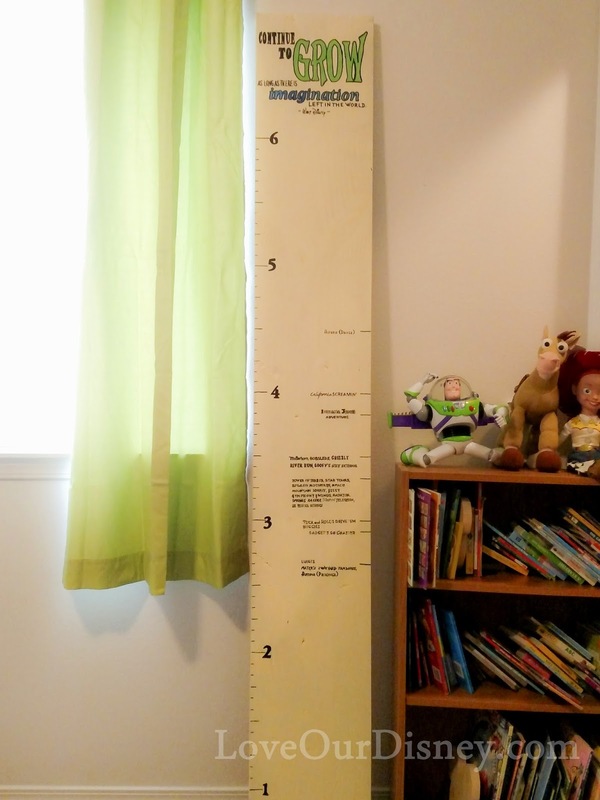 I have always thought how fun it would be to have that be a growth chart. Finally, while deciding how to decorate the twins nursery, I decided to finally make my idea a reality. These are pretty easy to make, and are so much fun. 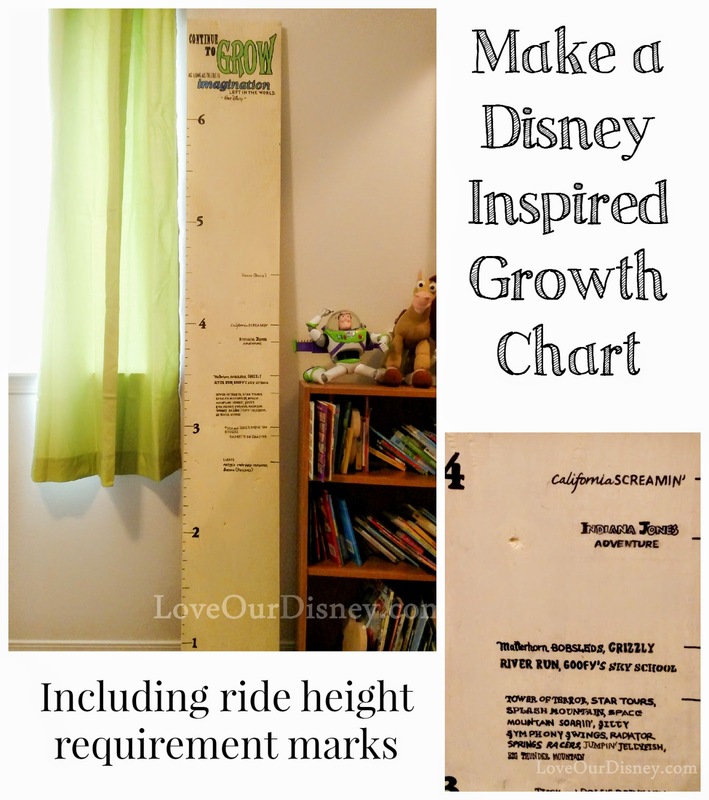 I figured most Disney lovers measure their kids based on ride height requirements, so I want to share how we made this DIY Disney growth chart with you. You can use MDF board to make your growth chart (find at the hardware store) but we already had a 1×12 that was 8 feet long, so we chose to use that. We cut it down to 6 1/2 feet, sanded it and painted it a very light yellowish color. After the paint dried, I went to mark my board. We decided the board would hang 6″ off the ground so I marked every inch up to 6′ (which was 5’6″ of markings). I also marked all the height requirements for Disneyland Resort (which you can find here). 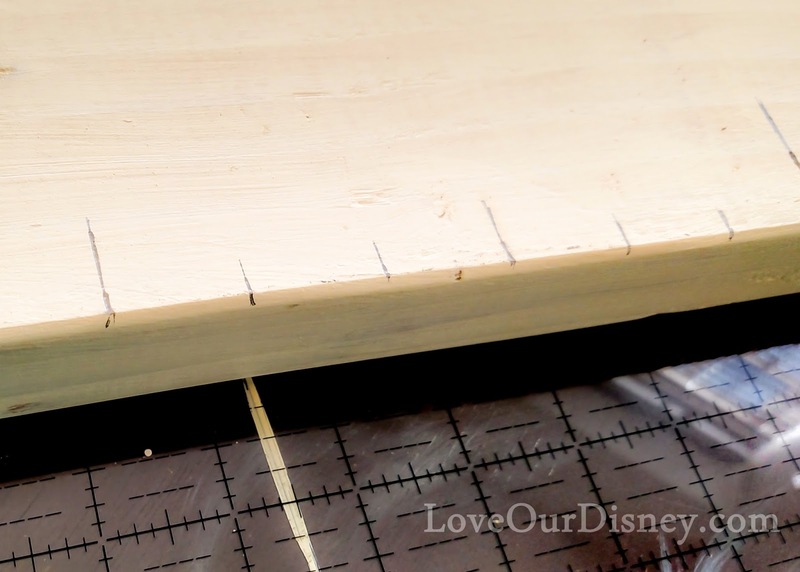 Remember to mark it 6″ lower than the height limit if you measure from the bottom of the board. I made the foot markers 1 1/2 inches long, the 1/4 foot markings 1/2 inch long, and the half foot markings 3/4 inches long. Ride height requirement marks were 1 inch long. 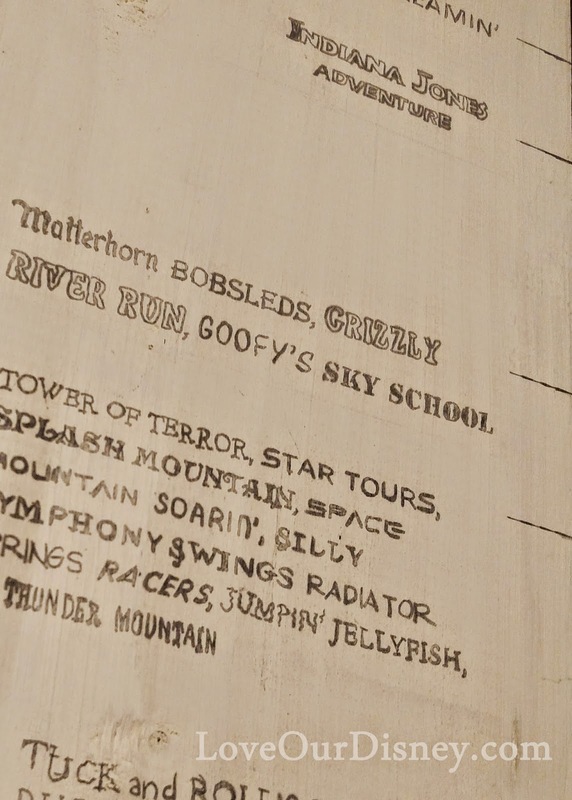 Next, I printed a quote for the top of the board and the ride names. I chose to use the quote “Disneyland will never be completed. It will continue to grow as long as there is imagination left in the world.” I decided to start the quote with the words “continue to grow…” I want my children to grow up but never lose their imagination. I went into printshop and designed the words how I would like them to lay out on the growth chart. 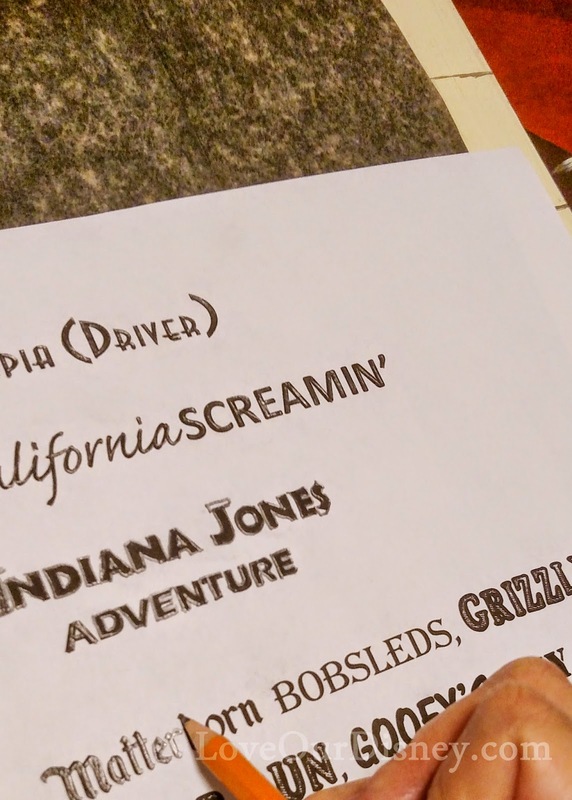 For the ride names, I did my best to find a font that matched the ride signs. If you aren’t super picky, you can just do them all in the same font. Honestly, I am not sure you can tell much of a difference on the finished product. I used around a 32 pt font. I would have loved to go bigger, but some height requirements (40″ for example) have a ton of rides. Next, I printed all of these out. I used carbon transfer paper to transfer the designs onto the wood. I chose to lightly tape down the transfer paper, but then I moved around the list of rides as needed. That helped save on paper when printing. Next I used paint markers to fill in the text and quote on the board. I also used them on the markings, and the numbers for the feet. Finally, after everything had dried, I erased anywhere the carbon transfer paper had left marks. Then I sprayed the board with a sealant and let it dry. We attached hangers on the back. Be sure to measure to an exact point on the board. We used the 6 foot marker. This will make it easy to hang it on the wall where you need it. We can now just measure 6 feet up and put in our nails/screws. We still need to do some rearranging before we hang ours up, but I couldn’t wait to show you this project so we leaned it up against the wall to get some pictures for you. What do you think? Will you be making one? Will yours be Disneyland or Walt Disney World themed? How Accurate Are Disneyland Height Requirement Markers? This is amazing and I am totally making one of these for my son! Such a great idea :o) Hope you are feeling okay (I remember my mom being pregnant with twins so I know how hard it must be, hang in there!)! This is so adorable! My best friend Terra who is a Disney fanatic and my cousin Jonathan are having a baby together !! My family is super excited and I think this is the best present that we could give them at her baby shower in a few weeks! I was wondering do you still have the original paper you printed with all the fonts! I would love it if you could send that to us or add it as a download to use on your site so that others can easily create this using the similar fonts?? 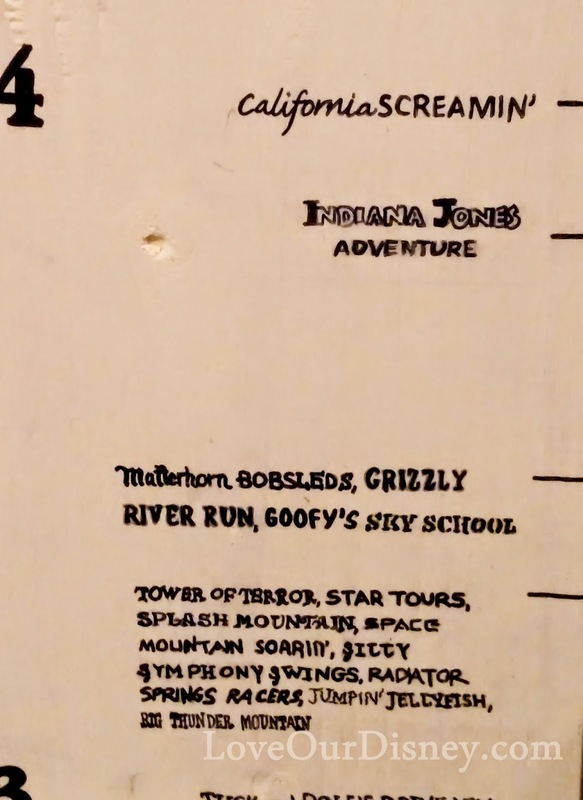 It would be extremely appreciated to have those font types for the rides!! thanks so much for this wonderful idea! I will look and see if I have it saved as a word document, but for many, I just tried to find similar fonts. I would like the download of fonts too, if you have it. Thanks! I had decided to do an attractions height chart for my son, who is OBSESSED with roller coasters. I made the height limit spreadsheet (Disney parks plus SeaWorld, Busch Gardens and Universal) and prepped the board and my artist hubby is going to do the attraction lettering. Found your site when I was trying to figure out how I wanted to lay out the height restrictions lettering. Thanks for helping me visualize the layout! That sounds amazing! Glad I gave you a little design inspiration for the layout! Just saw this and I want one for my grandson, he gets so excited for all the attractions but is still very limited on which ones he can ride. Can you email me the fonts you used? I actually just browsed my fonts for similar ones. I am sure you could search online for the fonts for each ride.